CHASING FOOD DREAMS: New Zealand Natural, Sunway Pyramid: Delicious Icy Treats with the World of Cravings Promotion! New Zealand Natural, Sunway Pyramid: Delicious Icy Treats with the World of Cravings Promotion! Nothing Beats An Icy and Luscious Ice Cream at Any Time of the Day! I could never say no to ice creams, even more so when it is New Zealand Natural. So when I found out that there is the Sunway Pyramid World of Cravings promotion going on for the whole month of and one of the participating F&B outlets is New Zealand Natural Premium Ice Cream, I was deliriously happy. Of course I had savored New Zealand Natural Premium Ice Cream before but I was told that this round, I will be savoring some of their latest creations in conjunction with the World of Cravings promotions. New Zealand Natural started in the land of kiwi where its fertile land provides the sheep with loads of greens to produce glorious dairy. One of the largest premium ice cream parlour chains in New Zealand and Australia, New Zealand Natural started when the owner decided to make his own premium ice cream using only the best of the dairy cream from his country without any artificial flavoring or coloring. New Zealand Natural made its way to Malaysia in December 2003 and has been serving up luscious range of its premium ice cream to many here since then. They offer a range of Full-Cream Ice Creams, 99% Fat-Free Sorbets, 97% Low-Fat Yoghurts, Milk Shakes, Juice Blends and Smoothies. Their Sunway Pyramid outlet is fairly large with a few tables for dine-in while most simply prefers to enjoy their ice treats while shopping around the mall. Chillers display its list of 28 flavors of ice creams on daily basis coupled with classic toppings served in cups or wafer cones. New Zealand Natural is committed to the Green cause and use environmental-friendly packaging as their Take Home Packs together with freezer bag. Besides all the icy cold treats, New Zealand Natural also serves up hot coffee, tea and hot chocolate. The 28 flavors of ice creams boast a list of interesting flavors such as Strawberry Cheesecake, Boysenberry Dream, Choc Fudge Brownie, Chocolate Ecstasy, Hokey Pokey, Kiwi Sensation, White Chocolate Raspberry, Crème de Coconut, Durian Divine and more classic favorites. Their sorbets and frozen yoghurts are equally gorgeous with Forest Berry Frozen Yoghurt, Mango Passion Frozen Yoghurt, Berryfruit, Lemon Lime, Mango, Passionfruit and Superfruit Sorbets. The sorbets are perfect for those who are lactose-intolerant so there is no reason for anyone to miss out on having a New Zealand Natural! Our treats for the night started with the Yoghurt Pudding Sundae featuring a super tangy and creamy Forestberry Frozen Yoghurt with a fresh and fruity Mango Pudding before being finished with fresh fruits and a dark chocolate wafer stick. I adored the combination of ice cream and pudding, a match of textures with creamy silky and wobbly soft pudding. The flavors of berries and mango blend well. It’s a treat that would definitely win hearts of many. The Single Scoop Sundae is not too far behind as the combination of almond flakes, chocolate chips, fresh sliced apples and whipped cream is always the perfect sidekicks for any flavors of ice creams. We had a scoop of Chocolate Ecstasy which truly lives up to its name. Superbly intense with rich dark chocolate, I love how the cocoa flavor really stands out in the ice cream without much sweetness. All the sundaes are finished with a New Zealand Natural chocolate logo piece. New to the family are the Ice Cream Croissant and Ice Cream Doughnut. A fresh buttery croissant has a large scoop of ice cream snuggled cozily between its layers together with chocolate sauce and finished with a light dusting of icing sugar. Paired with the croissant is the Pecan Praline Crunch, a toffee flavored cream with bits of praline crunch. The toffee note matches beautifully with the buttery croissant. The Ice Cream Doughnut is simply made for indulgence. A whole sweet doughnut has a scoop of Cookies & Cream Ice Cream crowning its glory. Going further on the indulgence bit, there is also chocolate sauce, cocoa powder and icing sugar to complete it. Now if you never had an Affogato, you should. Combining the best of hot Illy’s Dark Roast Espresso shot with a scoop of Vanilla Classic Ice Cream, this dessert will have coffee lovers or ice cream lovers swoon at its bittersweet hot and cold combination. * Every purchase of Junior Ice Cream (RM6.90) will be upgraded to Regular Ice Cream (worth RM11.90). * Every purchase of Regular Ice Cream (RM11.90) will be upgraded to Large Ice Cream (worth RM14.90). The World of Cravings has many exclusive promotions going on for the whole month of April through several deals. 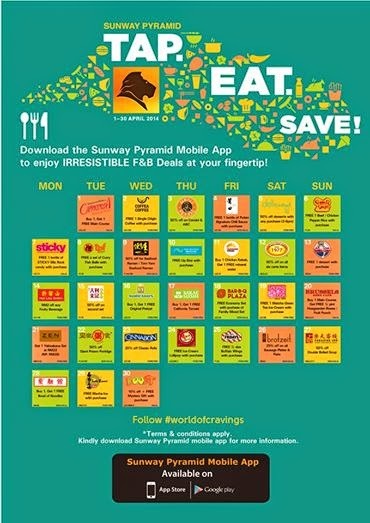 Download Sunway Pyramid Mobile App with exciting deals that include many discounts such as Buy 1 Get 1 Free Promotions or 50% discounts for dine-in at some of the 160 restaurants in the mall. 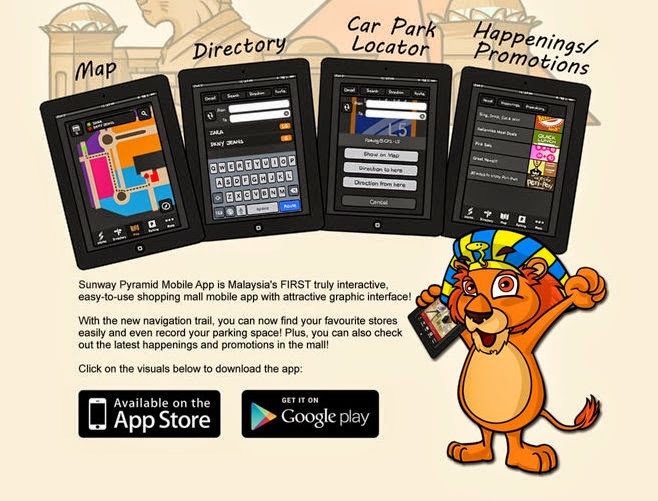 The mobile app is also perfect as a navigation guide for shoppers to record the location of their parked vehicle and also be navigated to the location at ease. 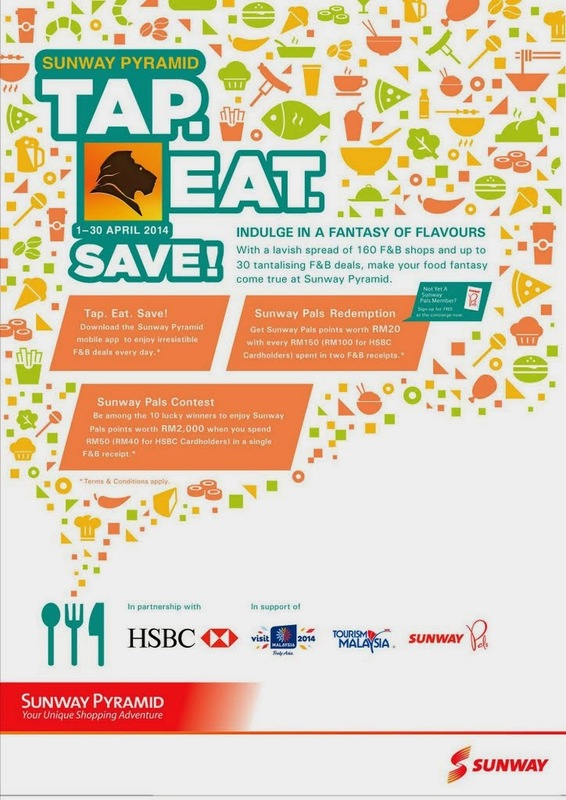 Sunway Pyramid Mobile App is available via Google Play and Apps Store at the ‘Tap, Eat, Save’ under the promotions tab or here. The more you shop, the more you are rewarded. 10 lucky shoppers stand a chance to win a total worth of RM20,000 in the Sunway Pals points when they spend RM50 (RM40 for HSBC Cardholders) in 1 receipt. Simply attached the receipt and drop it in any contest box located around the mall. When shoppers spend RM150 (RM100 for HSBC Cardholders) in 1 receipt at any F&B shops, they are rewarded with RM20 worth of Sunway Pals points, exclusive for its members only. Do register for this at the mall as it is free and check out the details here. It’s a sumptuous food paradise at Sunway Pyramid with over 160 F&B outlets and what better way to enjoy them all than with additional offerings and discounts! Let’s not forget to shop and get rewarded too in a mall that is recently recognized by Ministry of Tourism and Culture and Tourism Malaysia for the Best Shopping Mall Award in Malaysia Tourism Awards 2012/2013, the 38th accolade received by Sunway Pyramid to date. Had my share of those when I was there sometime ago. Pretty good ice cream, they have there. WAHHHH!!! I'll go crazy over these ice creams!! !